Creating an email is not a walk in the park. Behind any great looking email that managed to capture your attention, is the strategy of an email marketer, the vision of an email designer and the execution (and testing) of an email developer. This great email by Penguin Random House is not at all possible within a day’s worth of attempt. While the debate over making use of in-house v/s outsourcing email template production shall go on for long, either options are not viable for marketers and agencies without deep pockets. In such cases, the only saving grace for email marketers is DIY ESPs. Today, the Monks will shine some light on the newest member to join the Monks’ list of supported ESPs- MoonMail. The blog is purely based on the overall experience the Monks have had using the ESP and is not at all influenced or subjective to any promotional purposes. The USP of MoonMail is that it’s user-friendly and this is evident in the Homepage where the visitor is greeted by a minimal design. 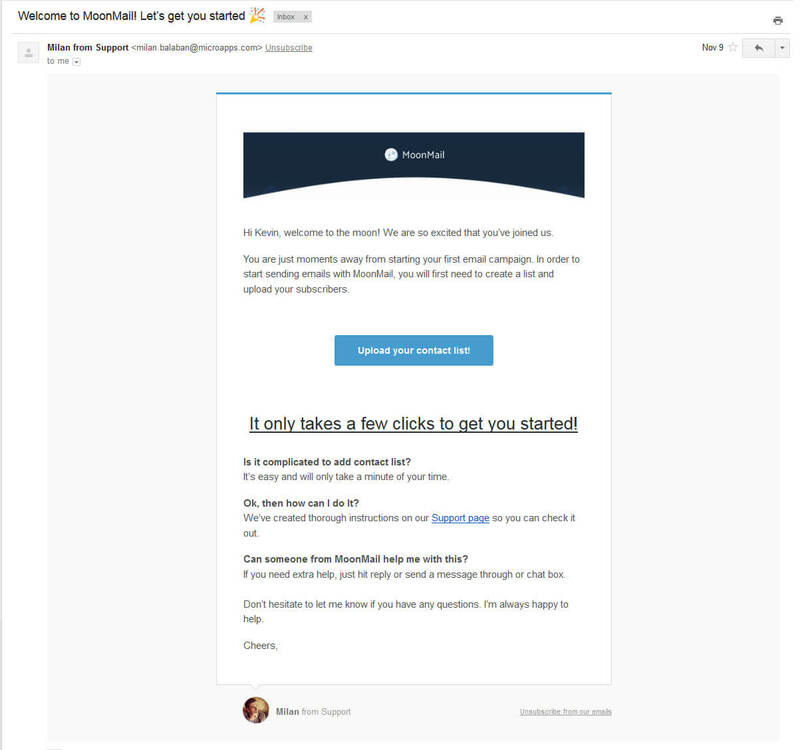 Following the best design practices, MoonMail’s homepage has different CTAs hidden as clickable links and only two strategically placed CTA buttons. 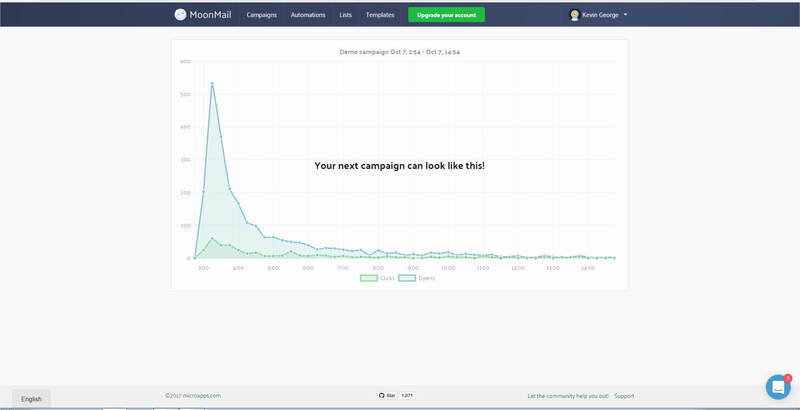 One thing we really liked is that for those who are unsure about trying MoonMail, can use a demo account to experience how it the works. The onboarding process is very simple and doesn’t need the user to jump through hoops to create an account. Just login with your Google account and you are all set. Although this is an innovative idea, MoonMail should also have the provision to register via business email ids and other domains. The user-friendly design is carried forward to the dashboard as well. The user is not at all bombarded with data from all directions upon logging in. The dashboard displays a graph with the results of the previous email campaign with different tabs at the top, which are self-explanatory. 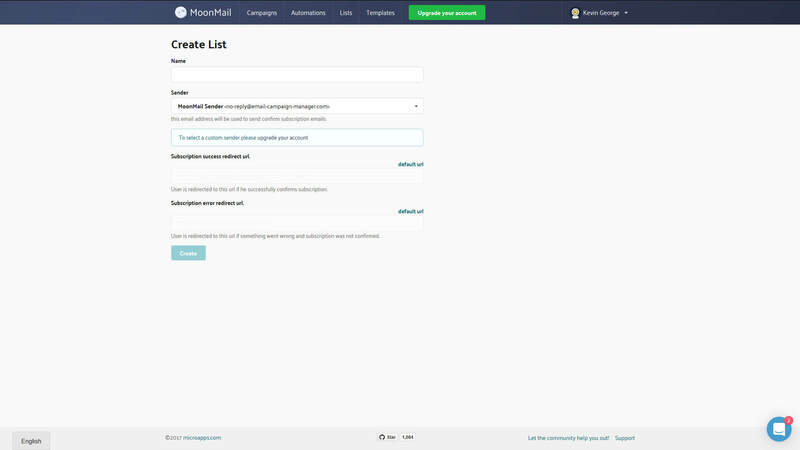 While creating a list in MoonMail, the paid subscription gives the user the option to add your own custom subscription success (and unsubscribe) redirect URL. Once your list is created, you can view & manage your subscribers, view the stats (as in the image below), modify the signup form and view the confirmation email. 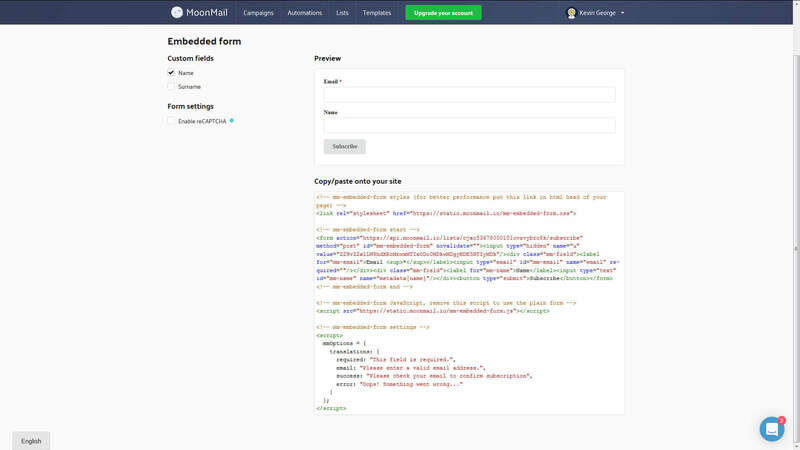 Even though the signup form is not as extensive as the one provided by MailChimp, MoonMail’s signup form is easy to find. 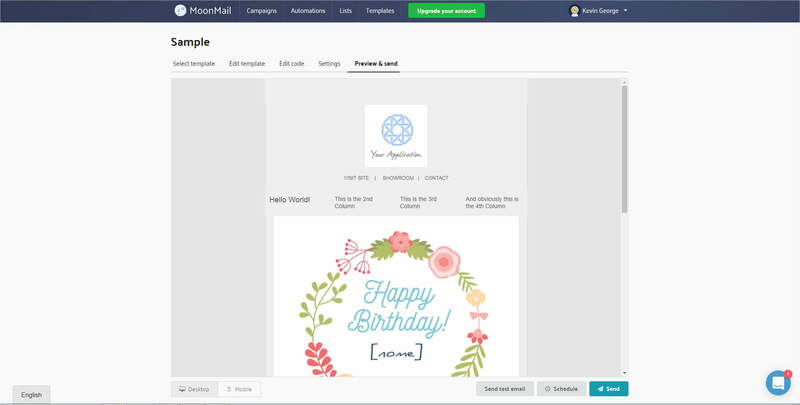 MoonMail currently uses the Bee Editor Plugin and Template library for email template production, which in itself is a great tool for creating email templates. Upon navigating to the Templates section, you have two sections named My Templates and Free email templates. Free email templates, as the name suggests, offers some pre-made email samples, which can be edited as per your needs. My Templates collects all the different email templates manually added by the user. What is noteworthy is that most ESPs tend to keep their email template library and user email template library separate for easy differentiation, whereas MoonMail has both of them on the same page so that the user can quickly select a pre-made template. 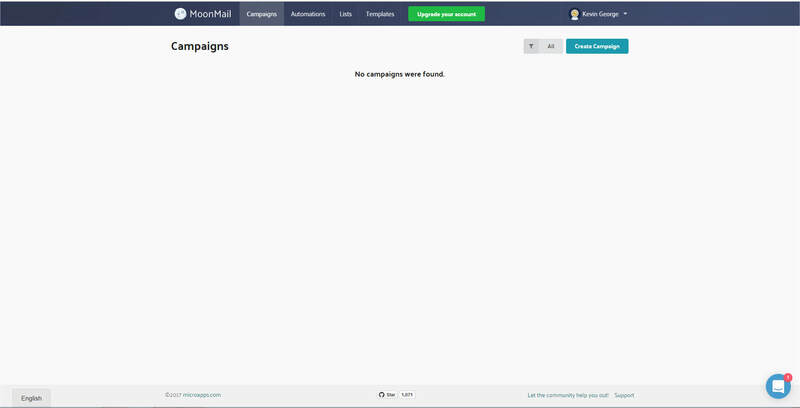 Moving ahead to the Campaigns Section, it shows you the list of campaigns you have created using MoonMail. 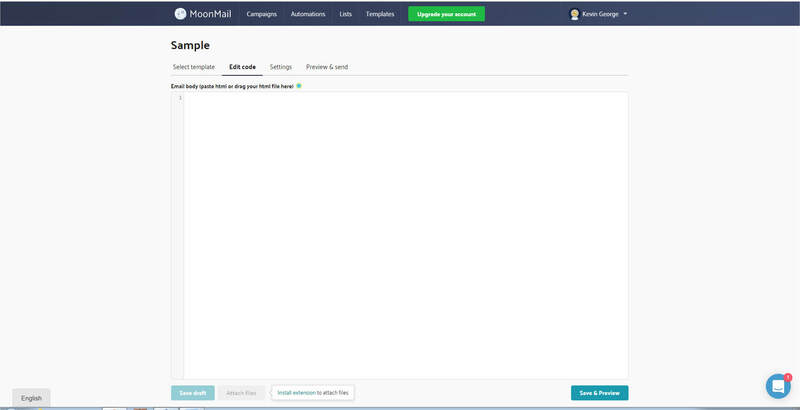 Compared to MailChimp, on creating a new campaign, the option to shift between the template library to editing the code to the email previews and even the Subject line and the From name is just a matter of shifting between different tabs. Like most ESPs, the MoonMail editor displays the email in both desktop and mobile layout. What MoonMail needs to improve? Unfortunately, easy user functionality of MoonMail is not without any scope for improvement. 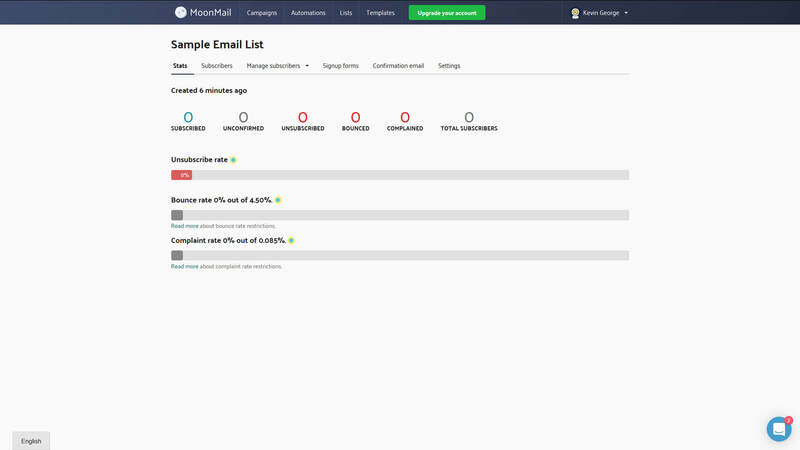 The free version of MoonMail is a great tool for those marketers taking their first plunge into the email marketing realm, but some vital email marketing aspects such as setting an email automation and editing the confirmation email are only available to the paid members. We suggest that of providing the free account users to set up one email automation campaign that is restricted to 3 emails. The only way to import custom-made email templates is to separately upload the images on the editor’s file manager and copy the HTML into the “edit code” section of the editor. Moreover, the file manager is only accessible when you want to replace any image from the template. In case of other ESPs, importing a custom-made email template is as simple as importing a zip file and hitting send. Moreover, users with free accounts cannot attach files along with the email. This feature is only available in Pro accounts. MoonMail only displays a generic desktop as well as the mobile layout for email previews. So, it is a good idea to check the renderability of your custom template on different email clients using Litmus or Email on Acid before you send the campaign. Improved features for Email Automation and Confirmation email editing. MoonMail’s editor is quite different from the other DIY ESPs in terms of simple user interface, quick load time, and the minimal time needed to jump between different tabs/options. 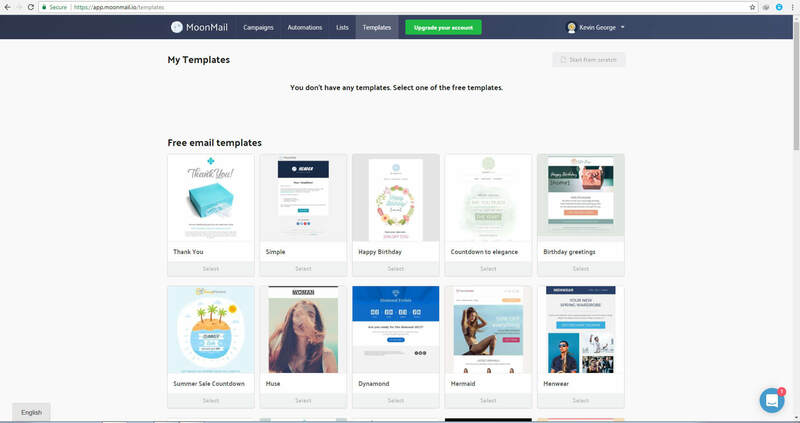 We can help you with designing and coding awesome email templates for MoonMail. Get in touch with us on hello(at)emailmonks(dot)com. Want us to review any other specific ESP or email editor? Do suggest in the comments section below. 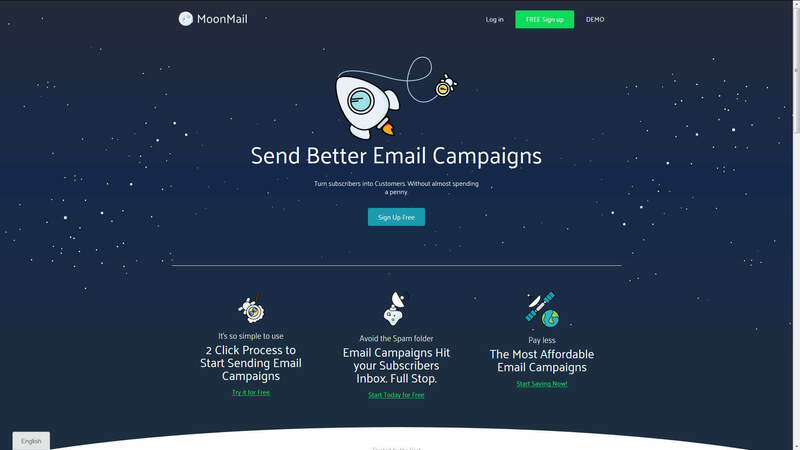 The post Reviewing MoonMail, the Latest Addition to our List of Supported ESPs appeared first on Email Monks Blog: Email Marketing Tips & Best Practices. Can Bulk Email Marketing Make Your Rich?